I’m excited to launch a weekly Player Spotlight; where I get to quiz introduce you to Airsoft bloggers, vloggers and other contributors to the Airsoft community. Each Thursday I’ll put a new post that shares some of their awesome content. This week we featured Will Greenwood on the live show and heavily discussed CQB. Due to this, it only seems fitting that for the first Airsoft Spotlight we feature his arch-nemesis on the airsoft battlefield. 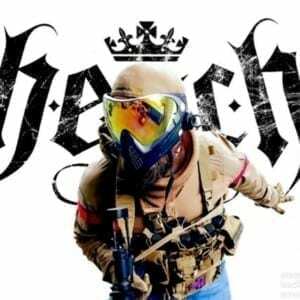 AN: Welcome to the 1st Player Spotlight Hench; please introduce yourself to the AN Community. Hench: Hi Graham, my name is Den Chapman (aka HENCH Airsoft), I’m probably above the average player age at 39 ???? #DeadSoon and have been playing airsoft for about 3 1/2 years after moving over from paintball (cue the shaming!). Soon after that I started uploading vids to YouTube mostly because I’ve got a totally shite memory and it gave me a means to remember whatever shenanigans I’d gotten up to! Until recently my local site was Strikeforce CQB which I probably played at a little too much, so this year we are making an effort to play at 2 new sites per month or at least until the woman says I’m spending way too much on travel. ???? AN: Since you mostly play in CQB – What does your Kit comprise of? Hench: Until recently I was running super light kit, TAD force 10 shorts, TAD crew, a Haley D3 rig and P* RIFs. Since I’ve spent the last 5 months recovering from an injury, I’ve done what every airsofter does with down time… I spent money on the interwebs! I’ve ditched the HPA systems I relied on for the past 2 years and gone back to two AEGs (see below) and a TM block1 gbbr. Also gone is the indoor CQB specific kit, and I’ve gone for a more rounded route with Crye RG pants and ubacs, Salomon forces boots, a Crye JPC with a Haley D3 and Flatpack attached. Helmet wise I’ve gone for an Airframe / Comtac combo and all the myriad of bits n bobs that compliment the loudout. I’ve not tried to recreate a specific loadout, just bought stuff I liked the look of. The woman will never find out how much that little lot cost. NEVER. After all you buy Crye pants in Primark right??????? AN: Let’s hope your missus never puts a price on your second hand gear! What’s your favourite RIF and do you still own it? Hench: That’s an easy one, it was a Custom CQB build Tippmann by Incentive Designs. A short, loud, intimidating little smile making machine. I loved it to bits and had it longer than I’ve kept any other RIF, eventually though I grew tired of HPA lines and have just returned to the AEG and GBBR fold. Hench: Zoxna launcher! Without a doubt. 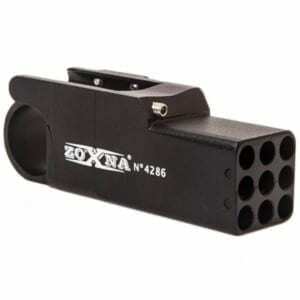 Savage little grenade launcher that pumps out 40 rounds in one volley. It’s a sheer terror weapon in cqb and never fails to bring a smile to your face. AN: I’ve just got one and should be picking it up by the weekend! How about your #1 best moment of playing airsoft? Hench: Oh god, just one? CQB affords so much constant action it leaves you with so many memorable moments. One of my faves featured in one of my earlier vids. I was with Will Greenwood and some other lads, holed up in a deadend putting up a last stand as the enemy team attempted to breach our lil safe space. Instead of going full milsim we started chanting “D Fence” American football style at the tops of our voices as we tried to slow the enemy team. We made them pay for it, but one by one of course we were painfully obliterated and our little killhouse was overrun, but damn did we have a laugh while we are at it ????. AN: Haha thats why I play woodland. Now; if you had unlimited funds – what’s one RIF you would buy? Hench: I just bought 2 of my dream RIFs, the joys of being a kept man or “Trophy Husband” as I like to call it ???? A no expense spared build by the magician who is Sam Liggat at Kingdom of Airsoft based on the LVOA platform with Bluetooth Spectre, KOA ultra motor, EdGI barrel, seigetek gears etc etc and am tracking delivery as we speak of an Umbrella Armoury OCAW Alpha BR. Can’t wait to see how one of the best UK techs stacks up against one of the best the US has to offer???? AN: Woah, props to Sam Liggat, a technical genius (and r-hop god!). Finally, what is one rule or change you would make in Airsoft? Hench: Hmm, I should be PC and give a nice safe generic answer, but I won’t. I’d boot people off site for being whiny lil muppets at CQB sites. You will get shot when playing CQB. A lot. Man up. Give as good or better than you get or get out. By that I don’t mean rain ropes of pain onto people, but expect to give and receive multiple shots in a volley. When I see people complaining about taking 2 or 3 hits in an exchange, I just want to suggest to them they take up a nice game of Sunday afternoon golf. Or ballet. AN: Ain’t that the truth! Well I appreciate your time Hench and I look forward to your return videos, until then though, I’d love to show the AN community one of your recent videos – the KSG Gameplay. It’s the new shotgun to the scene that wrecks in CQB….Enjoy! Don’t forget to Like and Subscribe!